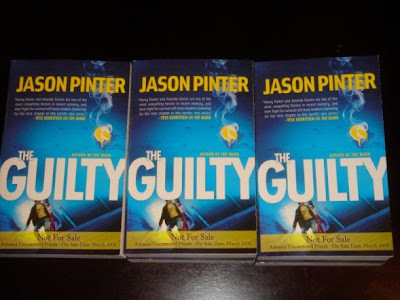 Galleys just arrived this afternoon for my second novel, THE GUILTY, which hits stores on February 26th. 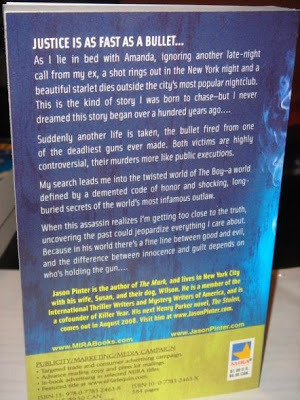 I love the coloring on the cover, and how my publisher kept the same font and the bullet hole motif as THE MARK. There will be some slight copy variations on the finished book, but it looks great so far. I'm very proud of this book. 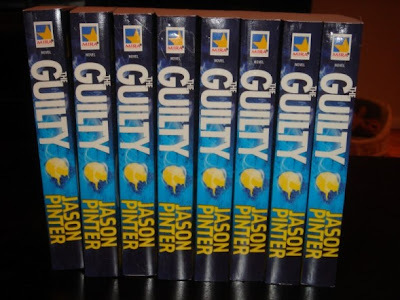 It's a lot more layered than THE MARK, and I've had the story for THE GUILTY in mind for several years. I really aspired to further the characters, add a few new ones, and give some neat twists. I hope readers enjoy it. Huge Congratulations! They look great! Seriously, great cover. I can't wait to get my hands on one. Those look really good! And anyone who sees that cover is going to instantly know it's your book, which is so, so great. This one looks bigger (maybe it's just the picture)... is it trade sized? Jennifer, it'll still be a mass market, perhaps your eyes are deceiving you...MWAHAHAHAH!!! congrats! looking forward to the release! Hopefully I'll be able to find the American version of this one as well. Otherwise it will be a long wait. 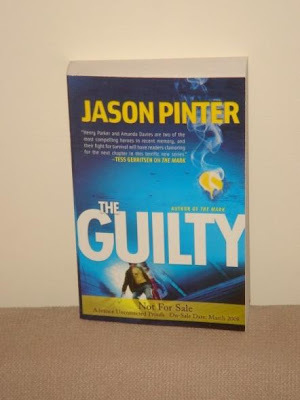 It's out 3 months before The Mark gets its UK release.